When this second volume of The Life of Saul Bellow opens, Bellow, at forty-nine, is at the pinnacle of American letters - rich, famous, critically acclaimed. The expected trajectory is one of decline: volume 1, rise; volume 2, fall. Bellow never fell, producing some of his greatest fiction (Mr Sammler's Planet, Humboldt's Gift, all his best stories), winning two more National Book Awards, a Pulitzer Prize, and the Nobel Prize. At eighty, he wrote his last story; at eighty-five, he wrote Ravelstein. In this volume, his life away from the desk, including his love life, is if anything more dramatic than in volume 1. In the public sphere, he is embroiled in controversy over foreign affairs, race, religion, education, social policy, the state of culture, the fate of the novel. Bellow's relations with women were often fraught. In the 1960s he was compulsively promiscuous (even as he inveighed against sexual liberation). The women he pursued, the ones he married and those with whom he had affairs, were intelligent, attractive and strong-willed. At eighty-five he fathered his fourth child, a daughter, with his fifth wife. His three sons, whom he loved, could be as volatile as he was, and their relations with their father were often troubled. Although an early and engaged supporter of civil rights, in the second half of his life Bellow was angered by the excesses of Black Power. An opponent of cultural relativism, he exercised great influence in literary and intellectual circles, advising a host of institutes and foundations, helping those he approved of, hindering those of whom he disapproved. In making his case, he could be cutting and rude; he could also be charming, loyal, and funny. Bellow's heroic energy and will are clear to the very end of his life. His immense achievement and its cost, to himself and others, are also clear. ZACHARY LEADER is professor of English literature at the Uni­versity of Roehampton in London. Although born and raised in the United States, he has lived in Britain for more than forty years and has dual British and American citizenship. In addi­tion to teaching at Roehampton, he has held visiting profes­sorships at Caltech and the University of Chicago. He was educated at Northwestern University; Trinity College, Cam­bridge; and Harvard University; and is the author of Reading Blake’s Songs, Writer’s Block, Revision and Romantic Authorship, The Life of Kingsley Amis, a finalist for the 2008 Pulitzer Prize in Biography, and The Life of Saul Bellow: To Fame and Fortune 1915–1964. He has edited Romantic Period Writings, 1798–1832: An Anthology (with Ian Haywood); The Letters of Kingsley Amis; On Modern British Fiction; Percy Bysshe Shelley: The Major Works (with Michael O’Neill); The Movement Reconsidered: Essays on Larkin, Amis, Gunn, Davie, and Their Contemporaries; and On Life-Writing. He is a Fellow of the Royal Society of Literature and General Editor of The Oxford History of Life-Writing, a seven-volume series. "Revelatory... A narrative at once pointillist in its detail and sweeping in its scope." "Zachary Leader’s The Life of Saul Bellow is that rarest of things, a towering biography that closes with a satisfying click." "Masterful...Leader shows how deeply biographical Bellow’s novels were: ruthless autofiction in a gilt postwar American frame." 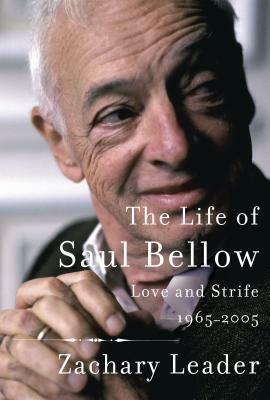 "This masterful account of the second half of Bellow’s life is impressive in both content and accessibility... A compulsively readable biography." "This is a top-notch exploration of one of the most important midcentury writers." "This is biography at its best and will appeal widely." "In this second volume of hisdefinitive biography of Bellow, Leader illuminates both Bellow’s remarkable personal experiences duringhis last four decades and the astonishing literary resonance of those imaginatively rewrought experiences...The many readers drawn to Bellow’s fiction will thank Leader forthis unflinching portrait." "A comprehensive and intimate biography."